Our Trolley Washnet Bag bag features a unique buckle closure system. 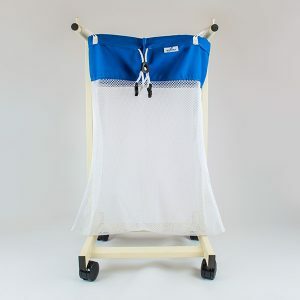 Overall, this system overcomes the issue of heavy loads breaking open like conventional wash net closure systems. The top section fabric of the bag also allows fitting for hanging tabs. Furthermore, enhancing its operational efficiency. Stock or custom sizes available. Choice of 10 colours for the top section.